This conference breakout will be led by the one and only Scott Keith. If you want to read a longer preview of Scott’s talk, go here. Dynamite does one thing well: it blows stuff up. 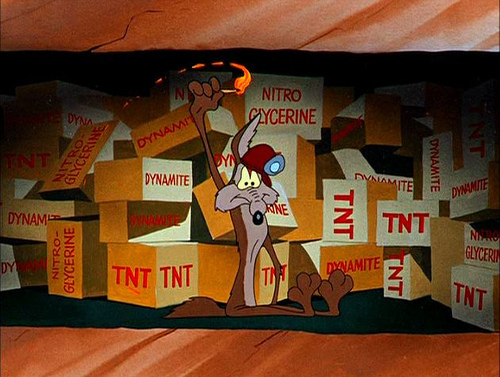 Dynamite is no more than an absorbent material, such as sawdust, soaked in a highly combustible chemical called nitroglycerin. The absorbent material makes the nitroglycerin much more stable. Attached to the nitroglycerin infused sawdust is either a fuse of a blasting cap. Once lit, the fuse or cap creates a small explosion that triggers the larger explosion in the dynamite itself. Once ignited, the dynamite burns extremely rapidly and produces a large amount of hot gas in the process. The hot gas expands very quickly and applies pressure, and thus blows up or explodes. The Greek word dynamis (δύναμις) is commonly translated as “power of God.” A college professor of mine once smacked his hands down loudly on the podium and said: “the Gospel is dynamite, exploding faith into the heart of the believer by the power of the Holy Spirit.” The Gospel, to me, from that day on, has been dynamite. It blows up the Old Adam and creates from the rubble the New Man who by faith stands in Christ alone. The idea that it was the Gospel of Christ––either through the stand-alone proclaimed Word, or the Word as it is connected to water in Holy Baptism or the bread and wine, body and blood, in Holy Communion––as the Means of Grace (media gratiae) through which God brings sinners to Himself was an idea unique to the Reformation. The idea itself is simple but carries with it immense implications. If God blows up my Old-Adam with the dynamite of the Gospel, then it is His work that saves from beginning to end. I do nothing to save myself; He does everything. This has always vexed Christians, especially new Christians. If God has saved me of His accord and His work on account of Christ, what can I do now for God? How can I serve Him? How can I say thank you? Often, the answer to this question leaves the questioner disappointed. The answer is, God doesn’t need your service. He is the almighty creator of heaven and earth. By His Word, all things were made that have been made. By His Word, He performs great miracles. By His Word, your Old Adam is constantly blown up with the dynamite of the Gospel. You need Him; He doesn’t need you. So then, the Gospel is the dynamite that constantly blows up the Old Adam in us, and then God uses the rubble to, by the work of the Holy Spirit, build up saving faith, trust, in our hearts saving us on account of Christ alone. He then calls people into our lives, inviting us to love them and be loved in return, serve them and be served in return, all through the ordinary everyday motions of our daily, often boring lives. This is the Christian vocation. When we fail––and we do––he forgives once more through the dynamite of salvation, the Gospel of Christ.